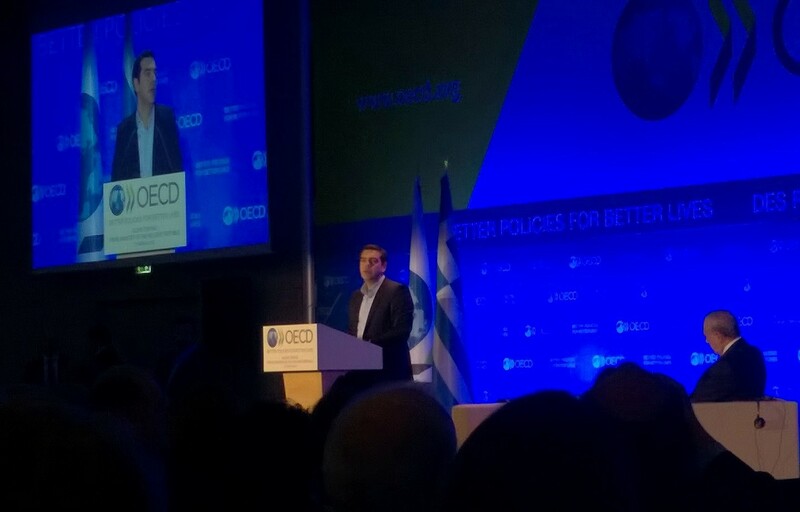 O.M-R. – I had the opportunity to attend Greek Prime Minister Alexis Tsipras’s keynote address at the OECD last 12 March on the occasion of the Greek government’s official request for technical assistance from this organisation to implement its structural reform package. I have since felt the urge to share my impressions of what, to some extent, felt like a historic moment. The large conference room was packed. You could sense an unusual deal of expectation and excitement among the audience, mainly OECD staff, who are, nonetheless, used to dealing with governmental figures of this level. Why a historic moment? Since it was created in 1948, the OECD (then OEEC) has never been asked so openly by a member government to again play the role it was originally conceived for, which was to help Europe back on its feet after World War II by administering the Marshall Plan and providing governments with the relevant technical guidance and expertise for their post-war reconstruction. Greece is not in ruins today the same way Germany and many other European countries (including Greece) were in 1945 after relentless bombings and battles. But the material and psychological impact of the recent economic crisis –a combination of financial and political corruption and negligence– is not significantly less traumatic for large sectors of the Greek and European populations. After what is probably the worst economic crisis of modern times there is an opportunity to be seized here, like there was in the aftermath of World War II; the opportunity to rebuild European society according to a set of alternative social and economic parameters, one that prioritises people’s needs over ideology, as Prime Minister Tsipras put it. European leaders in the aftermath of World War II understood that the only way of ensuring long-term peace and prosperity on the continent was a socially just Europe. Perhaps naturally, given the horrors they had newly experienced, they were imbued by a forward-looking, conciliatory and constructive spirit. A socially just Europe was, of course, the best recipe against the temptation of Communism –and, admittedly, one of the main reasons behind the Marshall Plan. (Today, as Prime Minister Tsipras implied in his speech, it is the temptation of the radical right that threatens Europe.) But beyond the immediate pragmatism of the Cold-War logic, there was a genuine belief in the universal benefits of a progressive agenda, including a publicly and properly serviced population with equal social and economic rights and opportunities. Very little or nothing of this European post-war spirit seems left today among the European leadership, and after decades of neo-liberal progression the welfare state has become an outdated cliché to many. This does not mean that those who have suffered the hardship and austerity caused by the Great Recession and international institutions’ response to it are not in need of believing once more in a social and political project that aims to improve their lives and their children’s possibilities in the future. In other words, a project that does not merely guarantee the status quo or the limited prospect for the majority of the population of sheer material survival without any hope for social advancement. At the same time, more and more people are suspicious of ideology –be that socialist, communist or neo-liberal– for the same reason they were in the aftermath of World War II: ideology too often amounts to dogmatism, which appears at best to cloud common sense, and at worst to bring out aggressive and destructive behaviour. Greek Prime Minister Alexis Tsipras and OECD Secretary General Angel Gurría. Reflecting this particular mood of pragmatic idealism as well as the reason for his official visit to the OECD, Prime Minister Tsipras chose to emphasise notions such as common sense, realistic assessment and pragmatic policies in his speech. After an intense day of meetings and discussions with OECD staff on different aspects of his reform plan, it was important to transmit the sense that the priority for the Greek executive is to technically implement these reforms in order to achieve tangible results as soon as possible. OECD Secretary General Angel Gurría, in turn, made clear that “the OECD was with Greece and for Greece, an extension of Greece’s own capacities,” in its quest to not only redress the Greek economy, but innovate and improve it. But Alexis Tsipras also spoke of “momentum”, “inspiration” and “boldness”. It certainly took the three of them to launch the European project almost seventy years ago. Above all, it took political will, which is the readiness to negotiate and compromise on both words and actions in order to move forward constructively for a higher and common good. The perception that Europe has again the opportunity of defining its future after the trauma of the Great Recession is heartening. It probably explains why many Europeans are following the unfolding of the Greek negotiations and reform implementations with keen attention, and, yes, a significant amount of hope. It is also the Greek executive’s boldness, their almost heroic determination to confront institutional blockage and ideological inertia in order to change the economic and political course of Greece, and Europe as a whole, which is deeply inspiring. More and more Europeans and non-Europeans have begun to see Greece as the promise of a different future, the example that could demonstrate that things can be done differently than they have for the past decades, and that politics has a role to play. With the risk of sounding naive or presumptuous, it was a touch of that post-war spirit which brought about a more socially just Europe that could be felt at the OECD headquarters during Prime Minister Tsipras’s visit. 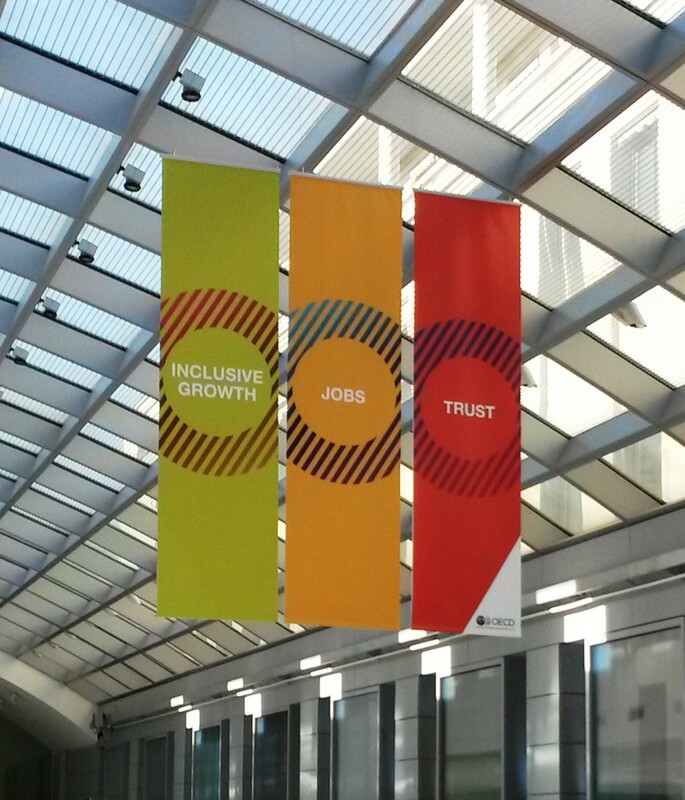 Both the Greek executive and the OECD may choose to talk about ‘inclusive growth’ instead of ‘social justice’, but in essence it is the same thing, and something that many Europeans have realised they do not want to lose completely and forever.